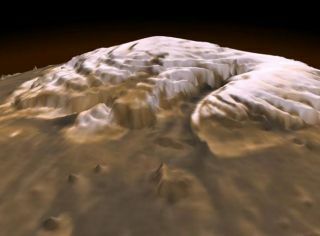 The north polar region of Mars is gouged by deep canyons that radiate out in what's called logarithmic spiral fashion, seen in this NASA computer rendering based on actual data. Peeringbeneath the ice at the north pole of Mars has now revealed the red planet maybe surprisingly colder than was thought. Any liquidwater that might exist on Mars therefore might be hidden deeperthan once suspected, closer to that world's warm heart, researcherssuggested. Aninternational team of scientists used the Mars Reconnaissance Orbiter to probethe north pole of the red planet with radar. The ice cap there goes about1.2 miles deep (2 km) and is roughly the size of Pakistan at 310,000 square miles large (800,000 square km). These scansrevealed the polar cap has up to four layers of ice rich in sand and dust, eachseparated by clearer sheets of nearly pure ice. Each dirty and clean layer issome 1,000 feet thick (300 meters). These dirtyand clean layers were created by ages of intense dust storms followed by icyeras. This five-million-year-long cycle was likely driven by wobbles inMars' tilt and fluctuations in the shape of its orbit around the sun. Themore sunlight the red planet saw because of these changes, the more the polaricecaps retreated and the more dust storms Mars saw. "Allthis layering is key evidence for theoretical models that predict that changesin Mars' climate are coupled with orbital changes," said researcher Roger Phillips, a geophysicist atSouthwest Research Institute in Boulder. Unexpectedly,the radar scans also revealed the massive weight of the ice cap does not deformany underlying sediment. This implies the crust beneath the cap is strong — more than 180 miles thick (300 km). To havesuch a thick crust, "Mars might be colder than we thought," Phillipstold SPACE.com. As a result, any liquid water that might be underground has tobe buried even deeper than once speculated. "If one thought that liquidwater was 5 kilometers deep (3 miles), it's now at least 30 percent deeper thanthat," he said. Philips andhis colleagues detailed their findings online May 15 in the journal Science. As to whyMars might be so cold, "perhaps it was robbed of its fair share ofheat-producing elements, such as uranium and thorium, when it was firstborn," Phillips said. Or perhaps the way heat flows on Mars is quitevariable, with the crust being colder and thicker at the poles and hotterelsewhere — "like Mars' volcanic provinces of Tharsis and Elysium." Theupcoming PhoenixLander mission, which will explorethe water ice just underneath the surface soil of the Martian arcticplains, might help shed light on the layering at Mars' north pole. To solve themystery of the heat of Mars, heat flow probes are likely needed all over thatplanet, as is suggested by the Mars Network Mission under proposal, Phillipssaid.